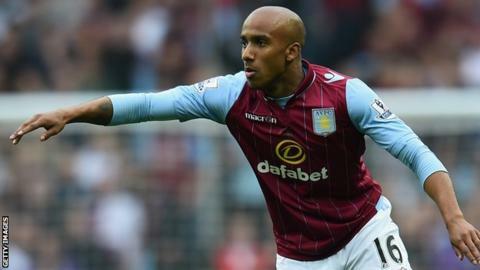 Aston Villa's England international midfielder Fabian Delph will have surgery on a dislocated shoulder next week and could be out for two months. The 24-year-old, who has started two of the last three Euro 2016 qualifying matches, injured his right shoulder in training on Tuesday. England face Slovenia in a qualifier on 15 November with a friendly against Scotland following three days later. But Delph is likely to be unavailable until just before Christmas. Belgium striker Christian Benteke has just returned from six months out with an Achilles injury, appearing as a substitute in the 2-0 defeat by Manchester City. Manager Paul Lambert feels the 23-year-old is close to a place to his starting line-up ahead of Saturday's match at Everton.